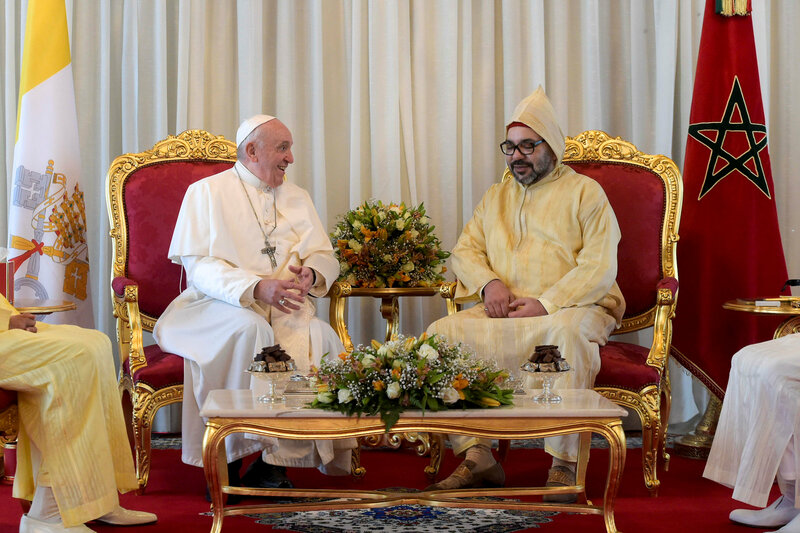 Pope Francis talks with King Mohammed VI after arriving at Rabat-Sale Airport in Morocco March 30, 2019 (CNS photo/ Vatican Media via Reuters). Hours after his arrival in Rabat, the capital of Morocco, Pope Francis and the King of Morocco signed an appeal calling for the preservation of the holy city of Jerusalem as a place of encounter for Jews, Christians and Muslims. The appeal comes at a time of strong political tensions and pressure in Israel, and on the eve of the Israeli elections. It also comes after President Donald J. Trump reversed decades of United States foreign policy in 2017 and transferred the U.S. embassy to Jerusalem and recognized the city as the capital of Israel. A small number of other countries have followed suit. This, together with ongoing periodic restrictions on access for Muslims and Christians to their respective holy sites in Jerusalem, has raised profound concerns in the Vatican and in Muslim countries. King Abdullah II of Jordan, who has a responsibility for the holy sites, came to Rabat some days ago and is said to have pleaded for support to maintain the status of Jerusalem. Though the appeal makes no explicit reference to it, a clear underlying concern is that the status of Jerusalem as a place sacred to all three monotheistic religions could be undermined. In their appeal, Pope Francis and King Mohammed VI said: “We consider it important to preserve the Holy City of Jerusalem / Al-Quds Acharif as the common patrimony of humanity and especially (of) the followers of the three monotheistic religions, as a place of encounter and as a symbol of peaceful coexistence, where mutual respect and dialogue can be cultivated. Pope Francis and King Mohammed VI expressed their common hope that “in the Holy City, full freedom of access to the followers of the three monotheistic religions and their right to worship will be guaranteed." Earlier in the day, Pope Francis and King Mohammed VI traveled from the airport to Rabat, with the king’s limousine alongside Pope Francis riding in the popemobile. They went directly to the Hassan Tower, a 12th-century minaret that is a symbol of the city. With thousands of people gathered on the esplanade in front of the tower, which sits where the Bouregreg Rivers meets the Atlantic Ocean, the pope and the king spoke of peace, tolerance, respect and religious freedom in a country where 99 percent of the people are Muslim, but tens of thousands of Christian students and migrants live temporarily. There are a large number of versions of the Bible, Old and New Testaments, available online for free access and provided with a search facility. Search the whole Bible for tolerate, tolerance, toleration for yourselves. One result from the Old Testament. Almighty God denounces to scorn the idea that he is tolerant. Now, as for the King. He can truthfully say that Christians and Jews are not totally forbidden to practice their religions, but they must pay the jizya and feel themselves submitted. The headline says ALL religions, I strongly doubt it. Try being a Hindu or a Confucian or a Jain in that 99% Islamic country.